There are eight new head coaches in the NFL for the 2011 season, including two interim coaches from a year ago that got their interim tags removed. Of course, hope always springs eternal when a new sheriff comes to town but these guys will have a tougher go at it due to the lengthy lockout. So how do I think the organizations in the market for a new head coach did in their hires? Let's take a look. The last time the Panthers had to hire a coach they made a really solid hire of a well respected head coach. John Fox did a tremendous job during his tenure in Charlotte only to have everything fall apart in 2010 when the team fell to the worst record in the NFL. The Carolina brass thought to try the same philosophy when they hired the well regarded Rivera, who was one of the best defensive coordinator in the league. I think Rivera can be the guy to get the franchise back on track and be a solid club as he gets respect from the players from having played, brings a lot of intelligence and energy, and has a no-nonsense style. I would've gone with an offensive coach but this is a good hire nonetheless. It was pretty clear that Browns czar Mike Holmgren was looking to hire one his own and he did just that by hiring Rams offensive coordinator, who formerly worked for Andy Reid. This was kind of an odd hire as Shurmur has not been in the mix for any coaching vacancies over the past two years but he did do a good job last year bringing along Sam Bradford, who has a tremendous rookie season last year. The Browns may have found their starter in Colt McCoy and wanted to get a coach who could help bring him along. Shurmur could do that but there were better offensive coaches on the market. I know I listed him on the coaching hot seat but that has more to do with the consistently inflated expectations of Jerry Jones and friends. The Cowboys organization was wise to give Garrett the full-time gig after he led a team floundering in the water at 1-7 under the hilariously bad coaching of Wade Phillips to a 5-3 record down the stretch and instilled energy and intensity that was sorely missing. The team really responded when he took over the club and the offense will be good once again, especially with Tony Romo healthy. The defense could be his undoing but the team made a great hire in Rob Ryan to be the coordinator. A lot of Broncos fans were opposed to this hire, mainly because Fox is coming off a 2-14 season in Carolina, but people have to realize Fox is a really good coach. Any coach that can take a team coming off a 1-15 season and have the team on the verge of a Super Bowl victory over the New England Patriots knows what the hell he is doing. Fox is a really good defensive coach so should have the porous Denver unit better but his tenure may be decided on what happens at the quarterback position. Then again, who's job security does not depend on his quarterback? Frazier took control of the woebegone team that Brad Childress had just lost all control over and brought a quiet confidence and leadership to a team decimated by injuries and stabilized them down the stretch. He has been one of the hot coordinators over the past few seasons and led a very good defense during his time in the Twin Cities. He has gotten the team to respond to him well and should have this club working hard and they try to get back towards the top of the NFC North. Widely thought to be the future coach in Oakland when he was hired as offensive coordinator before last season, Jackson put together an impressive offensive turnaround despite inconsistency from the quarterback position as he helped Darren McFadden get on track to becoming a star and found a playmaker with game-breaking speed in Jacoby Ford at wideout. You wonder what this offense could do once they got a solid quarterback but Jackson's done a great job with this offense. The defense was a mess last season and certainly could be again, especially with Nnamdi Asomugha off to Philadelphia. And it's always interesting working for the potentially dead Al Davis. Arguably the most targeted coach during the heat of the coaching carousel period in both the NFL and the college football spheres after the immaculate job he did taking a pitiful Stanford program to an Orange Bowl victory. 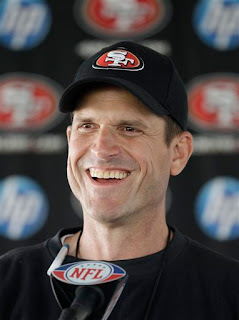 There is always a tremendous amount of risk hiring a college coach to an NFL head coaching job but Harbaugh seemed to be coaching with an NFL mentality at the Farm but now across the bay, he has his work cut out for him mostly because the team still does not have a quarterback, although I am very high on second round pick Colin Kaepernick. There are pieces in place but it all relies on the quarterback. The departure of Jeff Fisher was incredibly bizarre but that's how Bud Adams does things. Anyways, Munchak was one of the finest offensive line coaches in the NFL as proven by the fact that he has coached one of the best lines in the league. Plus his Hall of Fame playing career helps a little with players. He plans on relying on the running game as head coach, which makes sense thanks to one of the best running backs in the league in Chris Johnson and some questions at quarterback. What is Next for the New York Islanders? What Does the A-Rod Poker Controversy Mean?